for the SC/ST & OBC/SEBC candidates. Matron and Junior Matron vacancies are contract basis only. Interested candidates can send their applications to District Welfare Office Koraput on or before 10-10-2018 by 05:00 pm in prescribed format. Application form available online @Koraput.nic.in. Selection for this recruitment will be held based on educational qualifications and experience. This recruitment is only for the women candidates of Graduate qualified and SC/ST, SEBC or OBC candidates. Preference will be given to the candidates who are having higher educational qualifications and previous experience as a Matron. 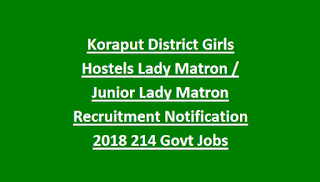 There are total 155 vacancies available in this recruitment of Koraput. As on 01-10-2018 candidates age limits are 35 and above age candidates will be preferable. For Lady Matron posts intermediate/HSC qualification is required. Preference will be given to the Graduate qualified candidates. Selection for this recruitment of Matron will be held based on Educational qualifications and Experience. First preference will be given to widow, Second preference will be given to Divorcee and final preference will be given to Single Member of family woman. Eligible candidates can download the application form online through the official website of Koraput.nic.in. Filled application from along with all necessary certificates to be send to the District Welfare office, Koraput District on or before 10-10-2018. 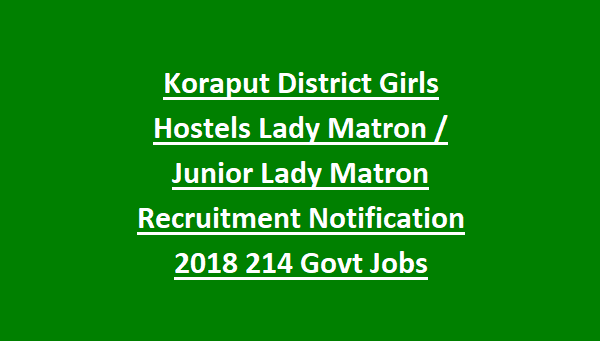 Click here to download the official notification and application form for Koraput District Girls Hostel Lady Matron Recruitment 2018.